For public transit users, the grind of a daily commute is two-fold. Not only do you have to cram onto a crowded bus or train, but you also have to worry about having your fare ready, whether you’ve got exact change, if your transit pass has expired, or what to do if your transit card won’t register. Public transit officials know that commuting can be a stressful experience. With the development of open fare transit systems, they hope to make mass transportation a simpler and more enjoyable experience. Most domestic transit systems today rely on a combination of fare payment methods. “Today, fares are paid with cash, tokens, or closed-loop magnetic or contactless media,” says Dave Blue, regional director for sales and marketing at Cubic Transportation Systems. The variety of technology incorporated into transit systems across the world varies greatly. SEPTA, the transit agency serving southeast Pennsylvania including Philadelphia, uses cash, paper tickets and tokens. Other cities like Hong Kong, London and Chicago utilize a closed-loop contactless card in their fare acceptance systems. In 2009, the Utah Transit Authority became the first in the nation to trial open-loop fare payments. Since this initial application, open-loop payments have made headway as the solution of the future with other cities piloting or implementing the technology. Open-loop systems enable riders to pay fares using bank-issued payment products. Initially, this revolves around contactless cards such as a Visa payWave, MasterCard PayPass, Discover Zip or American Express ExpressPay. But it can also include mobile wallets and NFC payments. “The convenience for the consumer is that you don’t need another form of payment or to carry another card. You can use the contactless bank card that you already carry in your wallet to get you through a fare gate or onto a bus,” says Blue. 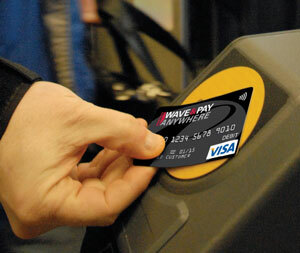 As contactless technology was added to the payment system, open fare transit started making waves. “It changed the way people looked at options for transit collection,” says Jerry Kane, New Payment Technology Project manager at SEPTA. Transit systems no longer had to opt for a proprietary, closed-loop system that only worked in their transit operations. With the addition of contactless, the amount of time needed to complete an open-loop transaction was reduced. This transaction speed is vital when moving people through turnstiles quickly. Once the transaction could be completed within 500 milliseconds, it was a viable option for use in the mass transit arena, says Kane. Transit agencies that have paper tickets, mag stripes or tokens have discovered that the accounting and technology behind the scenes can become a burden. Paper tickets and tokens require inventory and distribution, says Kane. Closed-loop systems don’t ease the burden much as transit agencies are forced to issue their own media and manage complex systems. They require agencies to invest heavily in technology and manpower to build and maintain the systems. “Today transit agencies spend significant dollars on proprietary fare media, media distribution and cash collection,” says Blue. Proprietary systems leave transit agencies beholden to one vendor for everything related to the technology, including upgrades and added functionality. “You’re stuck with that vendor as long as that system is operating,” says Craig Roberts, manager for technology development at the Utah Transit Authority. On the contrary, open fare systems enable transit operators to invest in communication and payment technologies that are based on open standards and widely deployed across industries, explains Roberts. This gives agencies the freedom to make changes and upgrade their systems as their needs change. “Ideally you are able to buy in a competitive marketplace and plug and play different components. Agencies are in better position to make changes,” says Roberts. Agencies can also transition from managing the entire payment operation to simply being another merchant in opensystem. “If the agencies can move toward open payments as their primary payment mechanism they can recognize substantial cost savings,” says Blue. Roberts adds that once an open fare system is in place it’s relatively easy to make changes. In a closed system where intelligence is held on the card itself, changing fares can require the agency to change readers and even cards. If the agency adds a pass product that’s card-based, it’s “essentially going to have to re-card and reprogram readers to take the product,” says Roberts. “Back office simplicity equals reduced cost for agencies. There’s greater efficiencies,” says Roberts. Because open fare utilizes current payment network brands, a transit agency doesn’t have to issue its own media or concern itself with issues surrounding adding value to the card. It also doesn’t have to provide customer service for the card since they’re not the issuer. Passengers don’t have to figure out how the fare system works. Through focus groups the UTA found that was an added benefit. “The issue of embarrassment is a major barrier to use of a transit system,” says Roberts. “If you have a contactless credit card in your wallet or purse, you can use transit in Utah today,” says Roberts. Though agencies see benefits from open loop, convincing riders to use their contactless bank-issued cards for transit is a different story. Currently, only about one percent of UTA fares come from open payment transactions, says Roberts. Half of ridership comes from third-party payers such as ski resorts, employers and schools that issue cards that work on the system. Another 25% to 30% of riders pay cash. The remainder purchase passes sold at retail locations like grocery stores. “We have it but haven’t been promoting it. People don’t know,” says Roberts, noting that the card issuing banks are responsible for promoting the use of contactless payment with cards. “It’s the chicken and the egg about contactless and open payment. You have to have a lot of merchants, then a lot of banks. Then you get promotion,” says Roberts. Although the UTA system has scant usage, it hasn’t deterred other agencies from delving into open fare implementation projects. In January the Chicago Transit Authority (CTA) awarded a 12-year contract to Cubic Transportation Systems to upgrade its Chicago Card system from a closed to an open fare collection system based on contactless and NFC standards. According to Ed Reese, general manager for business development at the CTA, the terms of the deal give Cubic a two-year implementation program and a ten-year operation and maintenance contract. Cubic won’t receive payment until the system goes live. Once operational, Cubic will earn a fixed per tap fee for the term of the contract, as well as a fixed monthly fee, says Reese. It’s a way for CTA to reduce operating expenses. “We shift the risks, credit, labor and security to a private contractor,” says Reese, adding that the CTA anticipates cost savings of $5 million a year. After the transition, rail fares will be 100% contactless. Buses will accept both contactless payment and cash. “This will lower the cash processing costs, which means higher revenue for us,” says Reese. When the new system is rolled out, the CTA will issue new media in the form of a Visa co-branded general-purpose reloadable card. Those who do not have a contactless-enabled card or are unbanked will use this card. “You can top up the card or link it to a credit card account,” says Reese. Once the system is live, the CTA will stop issuing its old card. The reloadable card will also be able to handle all of the various fare passes CTA offers. “All of the existing fare products are able to be purchased on the card at any point,” says Reese. In designing the software, the CTA intends to support different fare schemes, including fixed-route pricing, peak pricing, premium pricing and route specific pricing. “Things we can’t do now,” explains Reese. Open fare transit makes it easier for agencies to work with each other, because Visa, MasterCard and American Express are automatically interoperable with other systems, says Roberts. For an agency like the CTA, this feature is important because it helps the system comply with a new Illinois state law that mandates the three Chicago-area transit agencies have a universal fare card. The transition to an open fare payment system will allow the three Chicago-area transit agencies–CTA, Metra commuter rail and Pace buses–to work together in an account-based universal system, explains Reese. While Chicago is transitioning from one contactless system to another, SEPTA plans to replace its paper and token-based fare system with a contactless system dubbed the New Payment Technology Project. “We were facing a technological obsolescence,” says Kane. SEPTA’s current system uses read-only mag stripe technology for throwaway passes, a technology available since the 1980s. “It’s at the end of its useful life for fare collection,” says Kane. For SEPTA, switching to an open fare system also means cost savings. “It’s quite expensive to run fare collection, managing calendar passes, tokens, collection and distribution. It’s the full burden of running a bank, but we don’t get any money out of it,” says Kane. Transit vendor ACS will provide the complete solution including design, testing, installation and operation, explains Kane. The design phase is just beginning, with testing expected by the end of the first year and pilots to follow. Both systems will run side by side until the new system is installed overall. A challenge for SEPTA is figuring out how to implement the open fare system for its commuter rail operations, which make up 10% of overall ridership and 15% of revenues. “At trains, buses and trolleys you pay first but with commuter rail you pay on board. Conductors will have handheld readers for validation,” says Kane. SEPTA has not yet decided on the type of media it will use for this new system. “We are going to accept all forms of payment that comply with open standards,” says Kane. Still any transit agency must serve the unbanked population. To this end, SEPTA is exploring use of its own white label prepaid card as well as a general-purpose reloadable branded card. Because the new system is still years from implementation and has to run in parallel with the existing system, SEPTA does not know what cost savings it can realize. “There are a lot of hidden costs associated with running your own fare payment system that you would not encounter in an open fare system,” concludes Kane. As the mobile wallet becomes more prevalent, transit authorities may also be able to tap into the mobile user for payment. “Since the systems are built to accept contactless media they are a perfect fit for upcoming NFC technology. The mobile phone will be able to emulate a proprietary card if the agency wishes or it can be the conduit, through a ‘wallet’, for an open payment bank issued card,” says Dave Blue, regional director for sales and marketing at Cubic Transportation Systems. According to a report by the Smart Card Alliance, NJ TRANSIT in New Jersey became the first transit agency to test these waters when in October 2011 it partnered with Google Wallet for an NFC mobile payment test. The agency hopes NFC can speed up the ticketing and boarding process through shorter transaction times.